There’s something about fall and its relationship with school that makes large batches of something hearty and comforting quite appealing. After a long day of staring at a computer screen and text books there’s really nothing better than returning home to a “ready in minutes” bowl of _____. I’m leaving that space open for anything as at the end of the day exhaustion paired with the lack of motivation in me to cook lessens my culinary judgement and, I really would eat ANYTHING. Well today that’s all I needed and wanted. The only thing that got me through my chemistry lab of mixing some clear liquid with some other clear liquid to eventually produce a green powder (I was ready to eat that powder at one point — it was highly condemned) was the thought of coming home to a big pot of warm deliciousness. However that was only a thought, a day dream, rather. 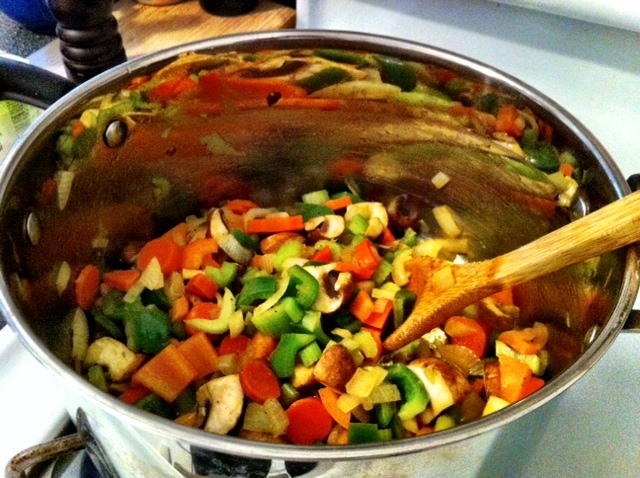 The reality was there really was no big pot of warm deliciousness…Until I made it; so, that’s what I did. What started as chili quickly turned into a TAKE ON chili when I discovered I didn’t actually have any chili powder. 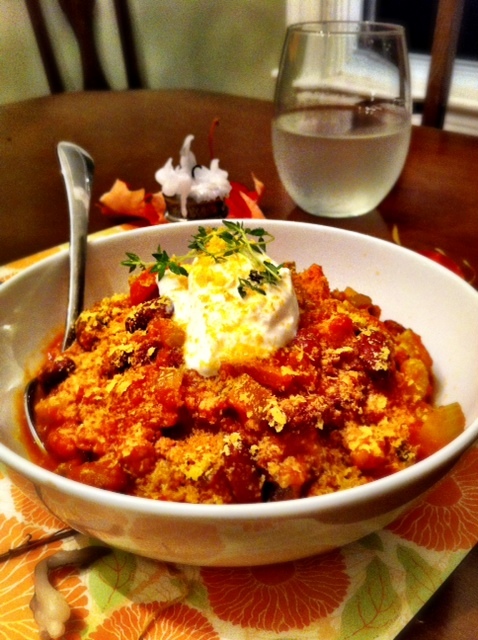 So I bring you the perfect fall meal: Harvest Vegetable Chili with a Twist. 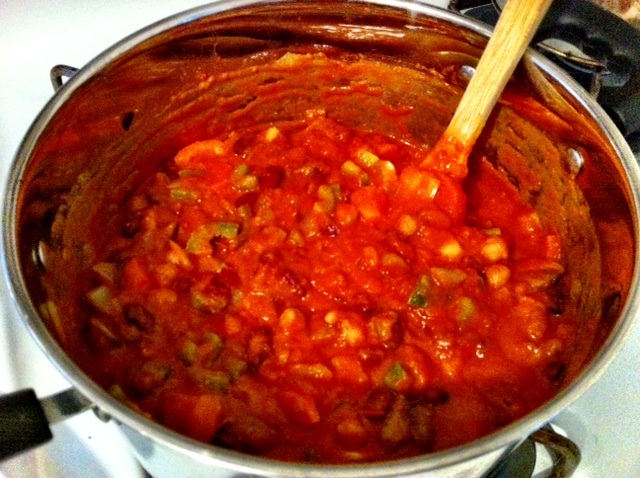 1 can (540 mL) bean medley, or make your own: garbanzo, romano, white bean etc. 1. In a large pot on medium heat, pour in grape seed oil. 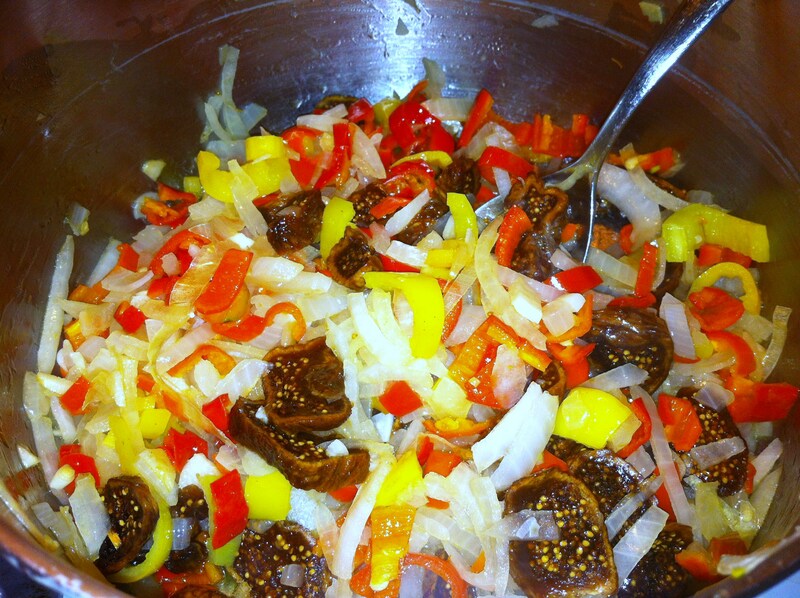 Add the onion, peppers, celery, and carrots, and sauté for 5 minutes. Add in the mushrooms and garlic and continue sautéing until onion is translucent. 2. 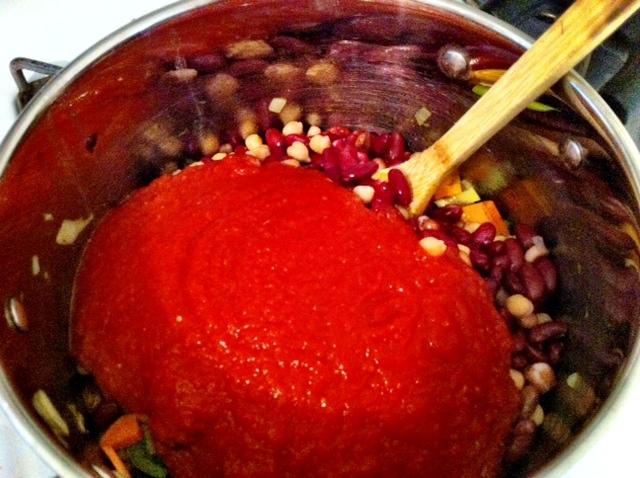 Stir in the beans and tomatoes, and water. 3. Add in the pumpkin and coconut milk. Add in all of the spices and apple butter; let simmer on medium until bubbles form on the top. 4. Reduce the heat to low and cover for about 35-40 minutes or until the vegetables are tender yet still have a “bite” to them. Serve over a bowl of brown rice or if you have more time on your hands throw together a batch of cornbread, because nothing goes better with chili, or not-so chili, than cornbread. 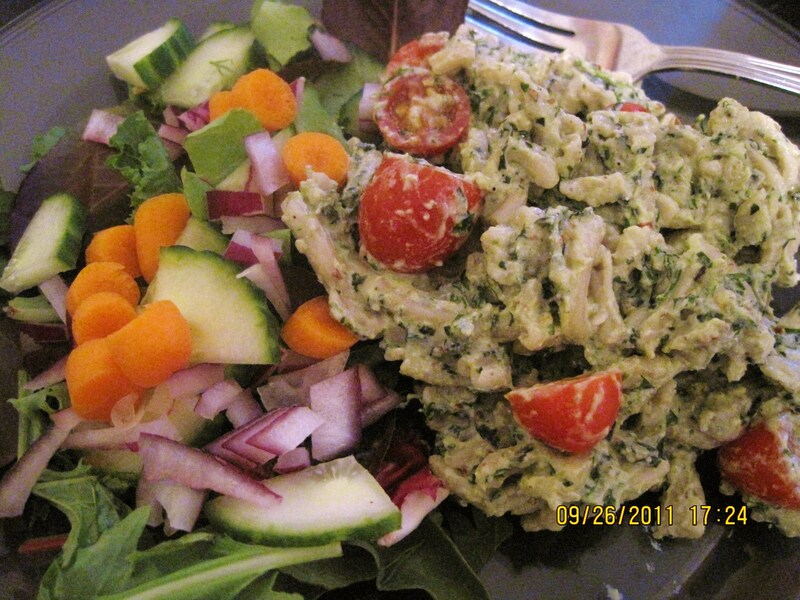 I sprinkled on some nutritional yeast and put a dollop of greek yogurt on top for extra protein and deliciousness! 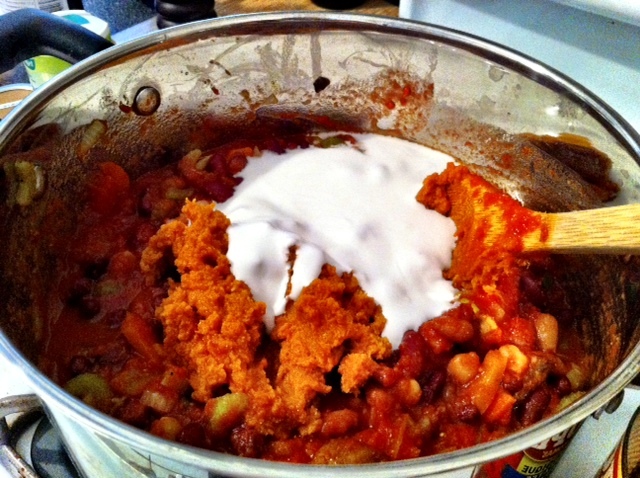 This chili just takes a few minutes to throw together and then it’s all about playing the waiting game. To speed up that game I quickly cleaned and then went for a run to take full advantage of the nearly 20 degree clear blue sky weather in mid October. 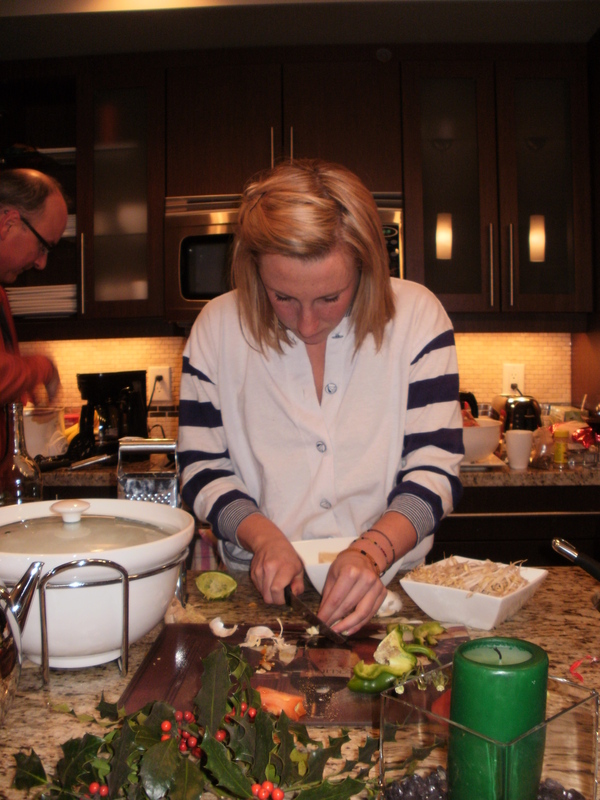 Growing up, there was never just one person in the kitchen. I don’t know which one of us decided it was okay to nix the “too many cooks spoil the broth” cliche, but we did. And for the most part (putting aside a few kitchen mayhems,) it worked. 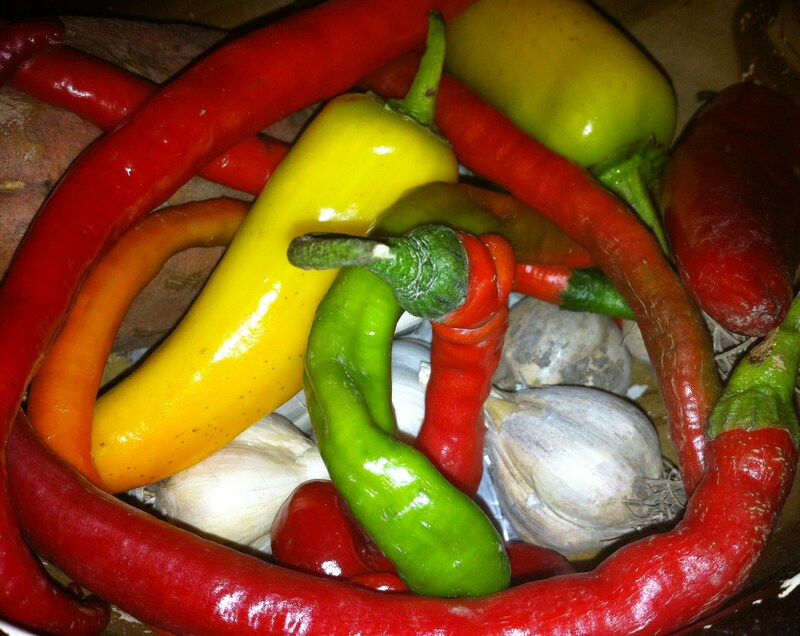 Mom would chop, my sister would stir, I would whip (and place orders,) and dad would spice. However, let’s not undermine spice. Half the time I don’t even think my dad would dip his finger in to taste test before he went “spicing” away. He had (and still does) this magical flick to the wrist that would somehow make the concoction of cumin, tumeric, marjorom, thyme etc. palatable…for some people. If you look really closely, you can see that "wrist flick." Dad’s spicing technique was not what some would consider “child-friendly…” Heck, I don’t even think many would call it “adult-friendly.” He had a way of adding a KICK to just about every meal. I remember many a times where he was the only one eating as we were too busy placing rice balls on our tongues and patting down our glistening foreheads. Sure, we didn’t necessarily “spoil the broth,” but we had a way of really ruining dinner time. After one too many utterly hot dishes (say 10 years worth,) we were forced to build up a tolerance to them. Now I can’t tolerate a meal WITHOUT spice. So in honour of my father, who turns 55 years old today, I decided to pick up a bundle of hot chilis from the farmer’s market in order to make my very own hot sauce. This is something I have never actually attempted before as I rely (a little too much) on my Sriracha. But there’s never harm in trying and I figured if my dad can do it then so can I! 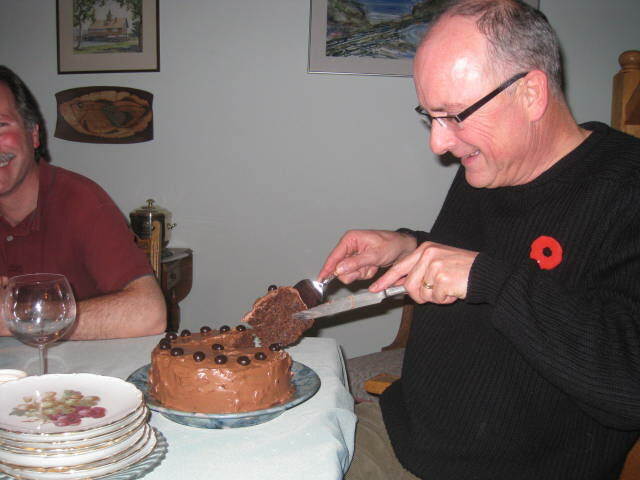 After reading through a number of recipes I discovered that there was one common message: wear goggles and gloves…However being known for slicing the tips of my fingers weekly, I figured that this would only impair my judgment further so I decided to reject it and away I went! 1. In a large pot, saute the onion and garlic in olive oil for about 2 minutes. 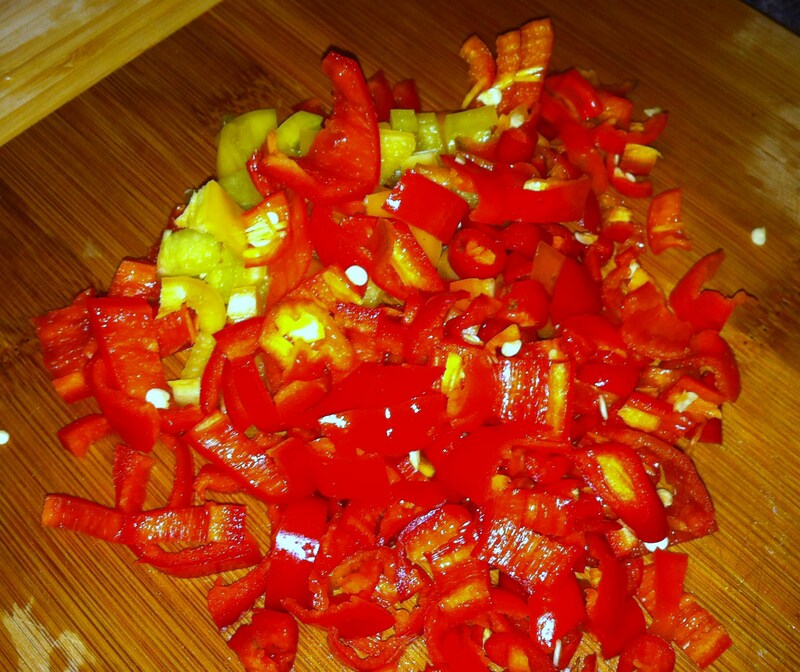 Add the peppers. 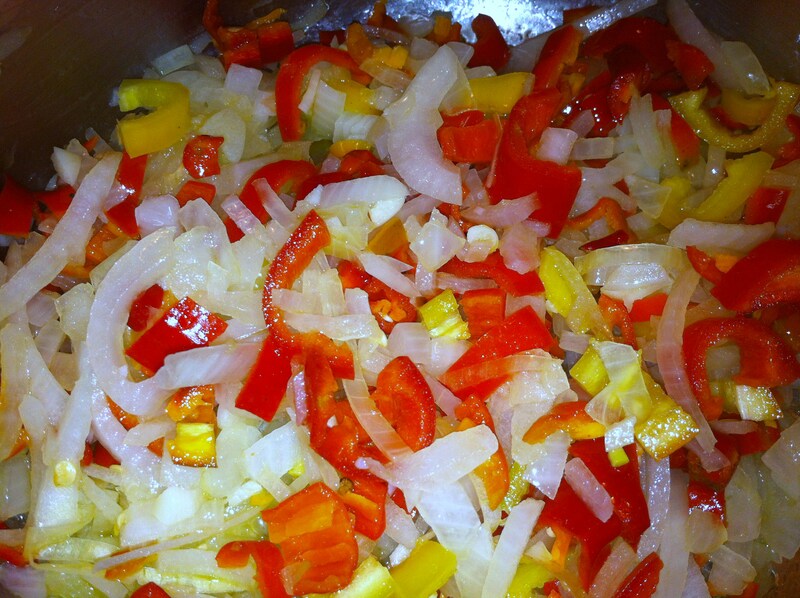 Saute for another 10 minutes until the onion is translucent and the peppers are soft. 2. Stir in the figs and continue to simmer for a couple more minutes. 3. 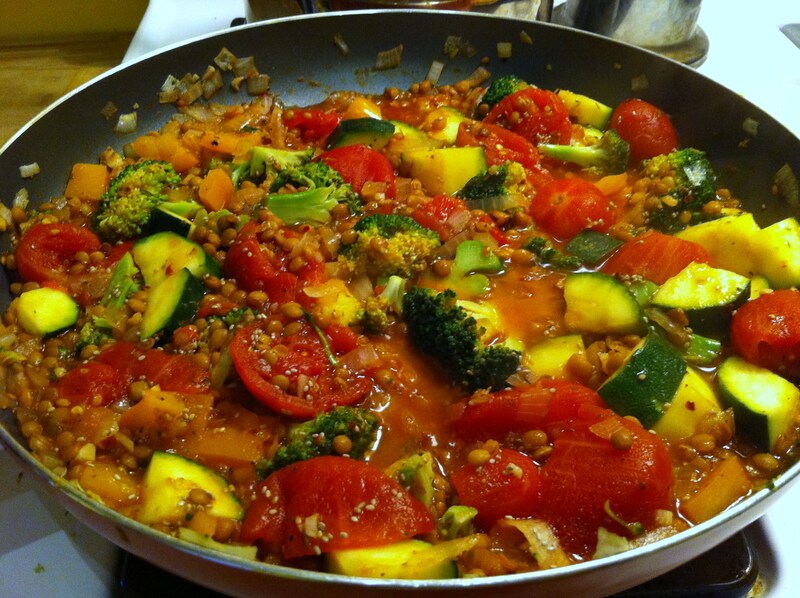 Add the crushed tomatoes, vinegar, and salt and simmer until the tomatoes have spread apart. Taste to see if you need more salt. 4. 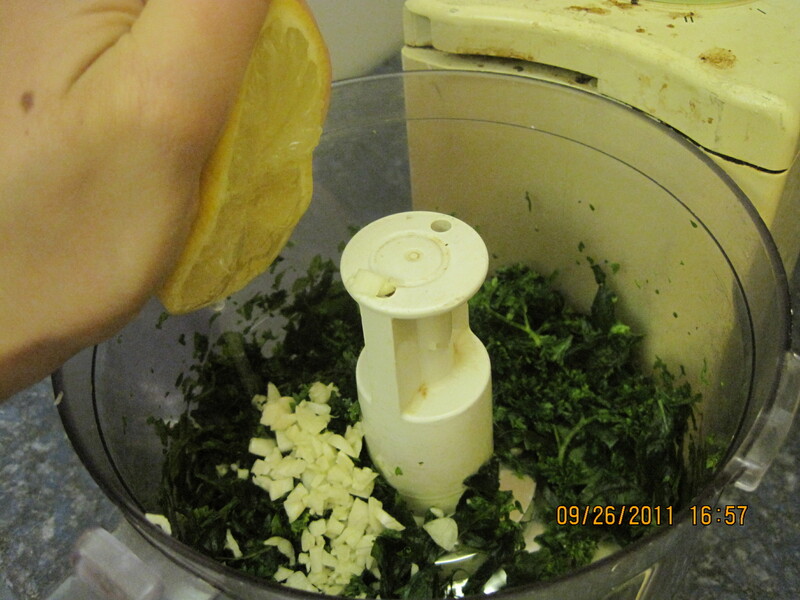 Carefully transfer to a food processor and blend away. Puree until a sauce has formed. 5. 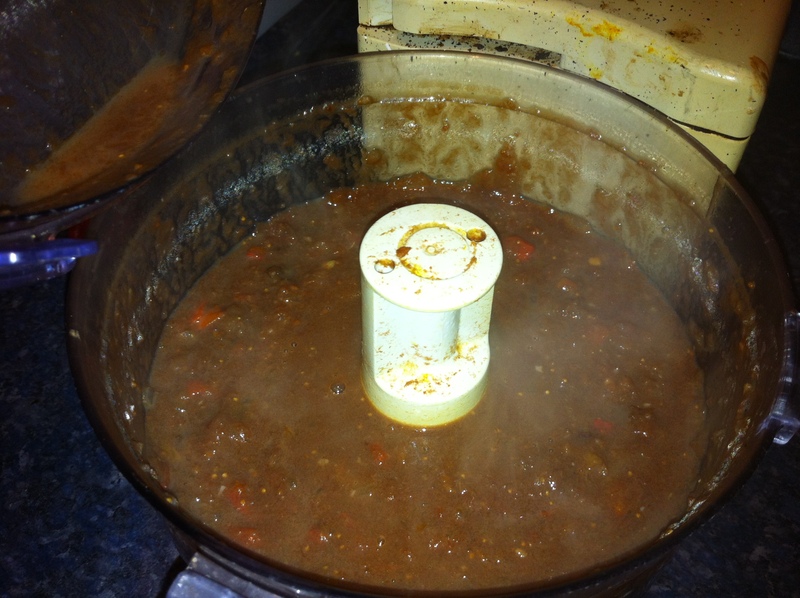 Optional: put sauce through a seive with very small holes to collect any of the bits that didn’t blend. I didn’t do this because I like a rustic looking sauce, but if you want to go for it!! 6. Allow to cool, and then bottle it up. Store in the refridgerator. 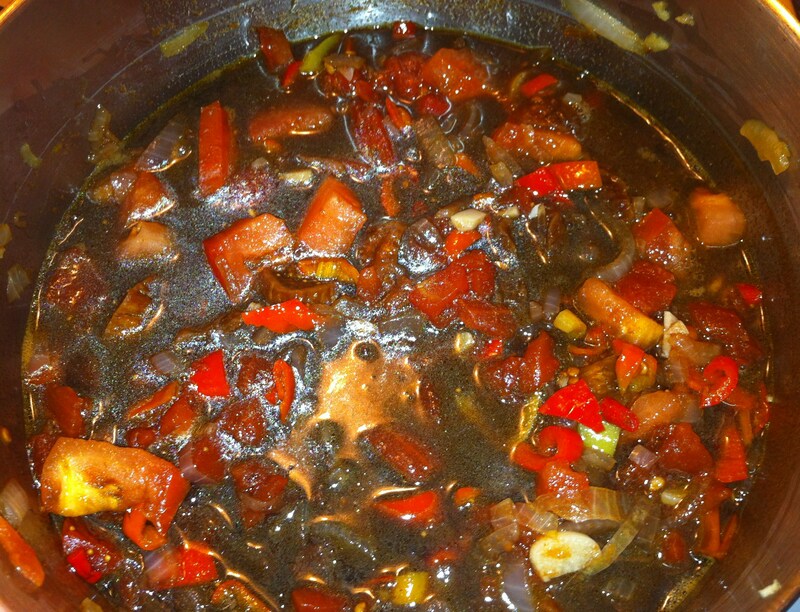 Thanks to the vinegar, the sauce will keep for months in the refridgerator. 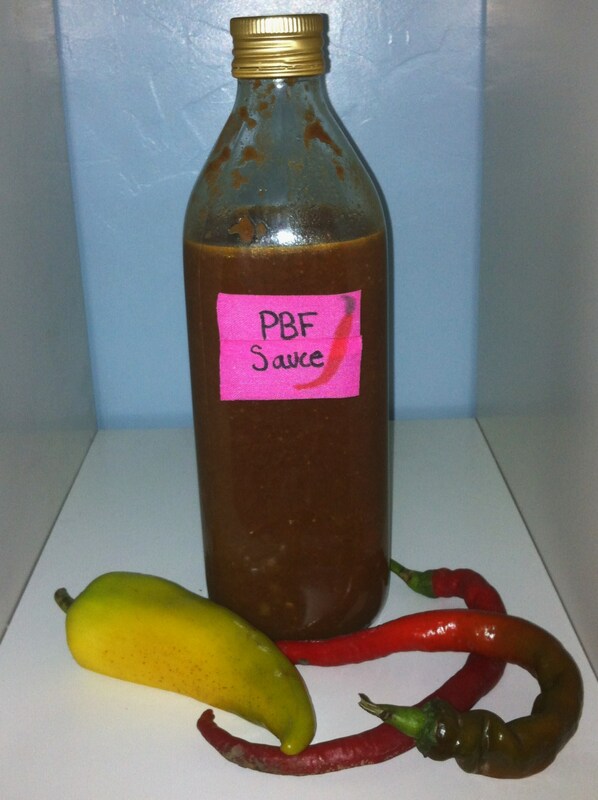 I am so pleased with this sauce as it is one that tastes absolutely amazing yet packs a serious punch. 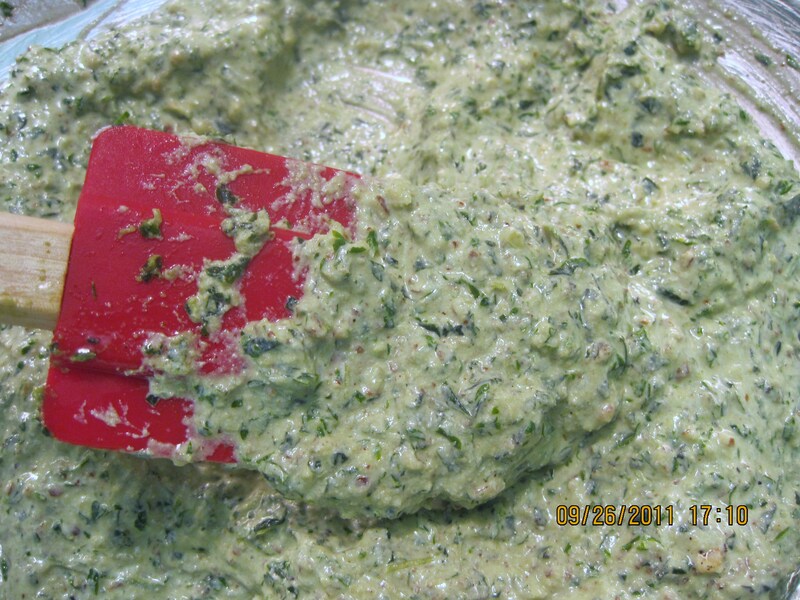 It can be used in stir fries, as a sandwich topper, on pizza, as a dip…ANYTHING. 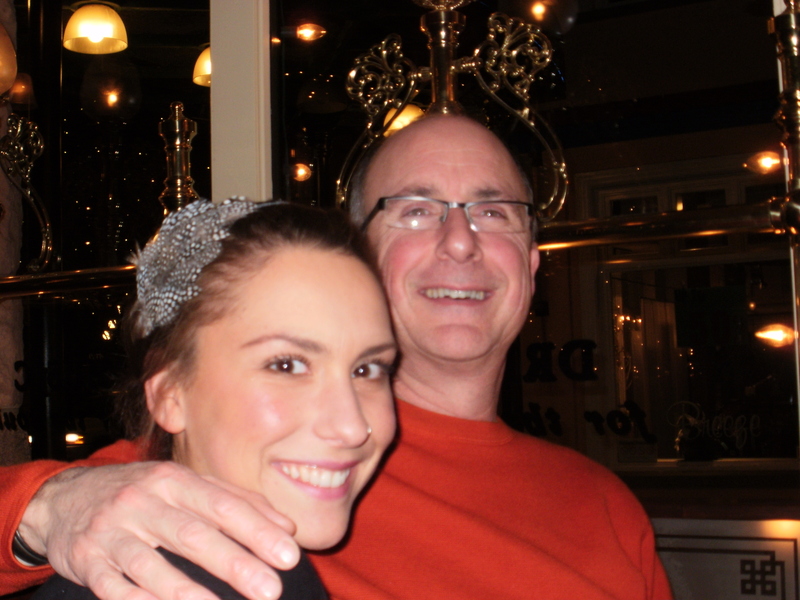 And dad, even though you’re not here to try it, I know you would be impressed. In the past month I have developed what one would call a “common-law” relationship with my roommate…The only thing we haven’t done is open a joint bank account and quite frankly, I think it should stay that way. Especially after seeing the Ikea bill she racked up yesterday. 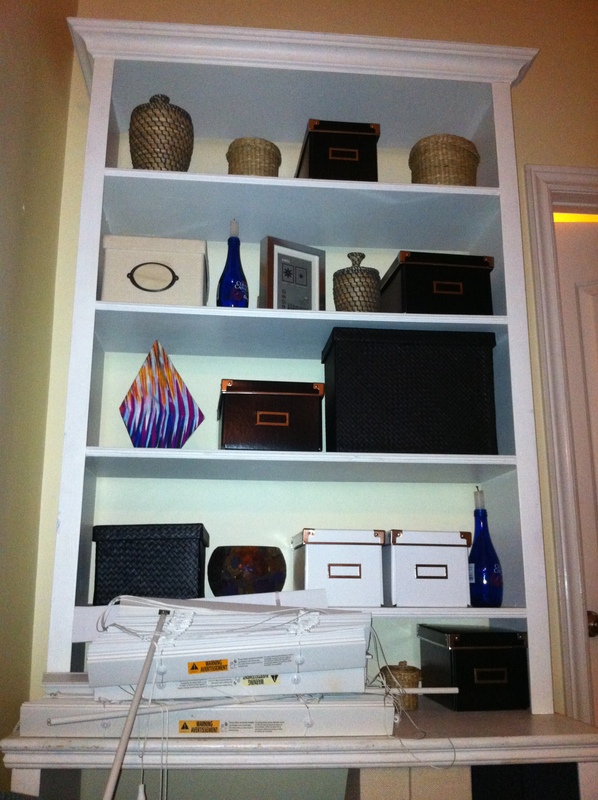 But she assures me all of those boxes were necessary. Anyways…I find myself mid-day suddenly concerned about whether or not Kelly found something for lunch in the fridge or what on earth I am going to make us for dinner. Today was no exception…Especially during my 6 hour lecture that went from being about photography to largely about the prof, himself. While he spoke on how great he is, I had lentils on the mind, and I was determined to find the perfect lentil loaf recipe. There was no time for any sort of loaf preparing and I was back to the drawing board…With lentils as the star ingredient. Hungry family members? 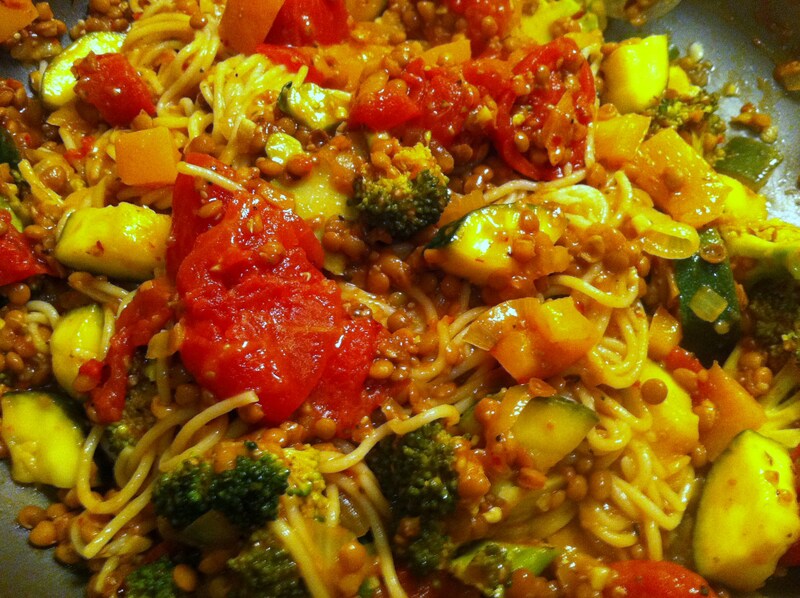 I give you Tomato Lentil Pasta Sauce. 1. On medium, drizzle olive oil into a large frying pan. Add garlic, onion, zucchini, broccoli, and pepper. Saute until tender, about 10 minutes. 2. Add the roughly chopped tomatoes, and about half of the juice from the can. 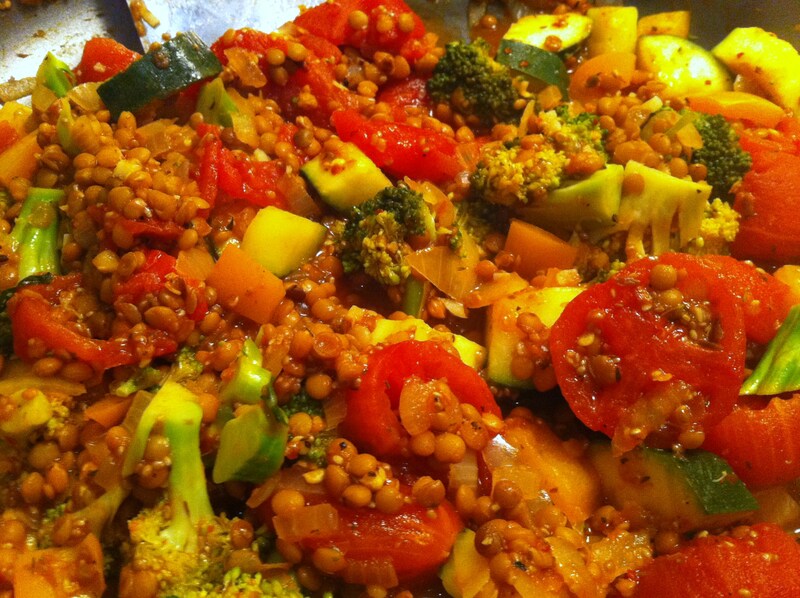 Then add the lentils. Simmer. 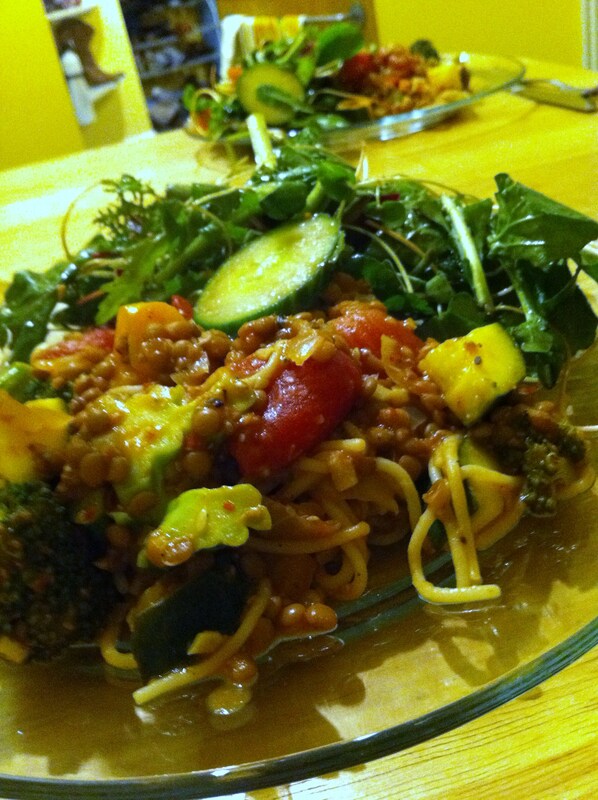 I served the sauce with brown rice spaghetti and a salad. Feed the vultures before they feed on you. 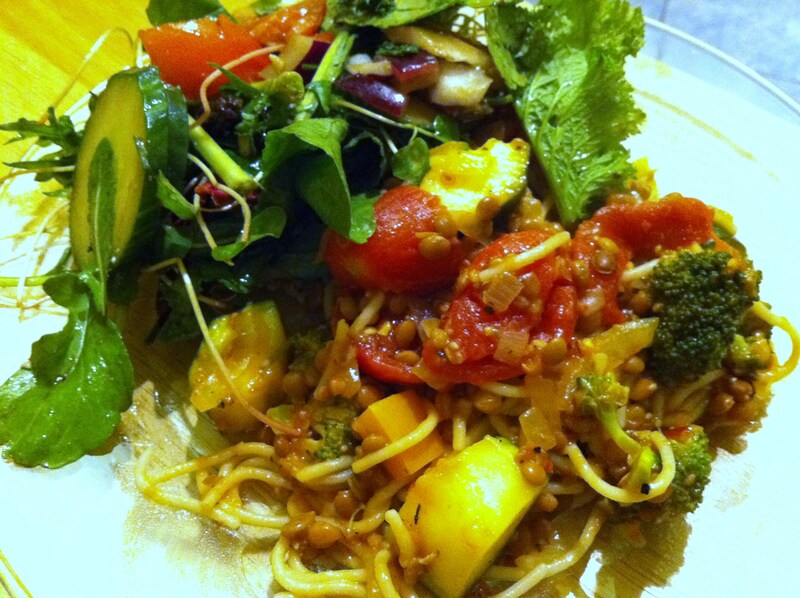 What do you make for a fast dinner? In three years, I have moved three times. You could say that I am restless, or you could say Toronto has a number of “dwellings” that look good from the outside, but leak out their bad qualities immediately upon signing a year’s lease. So with a third move in sight, I decided it was time to make a list: a list of must-haves and a list of must-not-haves. After already being exposed to most of the must-not-haves in Toronto, it’s safe to say that that list was far longer. However, there were some key priorities for me upon moving into a new home, one being a backyard or balcony. Sure you can laugh, but believe me when I say these amenities are hard to come by in the big city. So when I was led into a backyard on my hundreth viewing, I was sold. 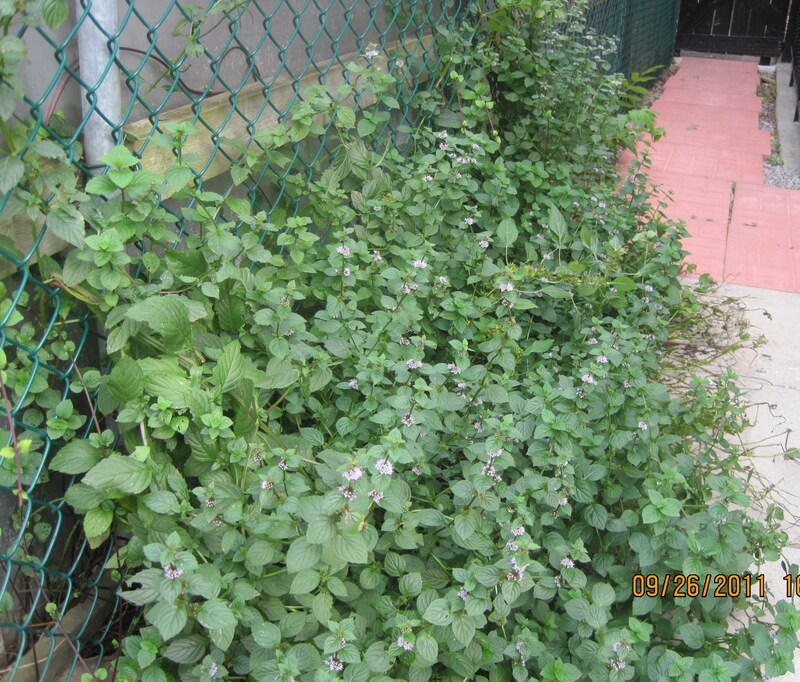 Not only was there grass, but there was a garden: an unruly tomato bush, a surviving pepper plant, a just started zucchini patch, a few sprigs of basil and chives, and a never ending spread of mint. Oh, the mint. I think it is the one plant out that could outlast a cold snap. It seems to just keep growing. 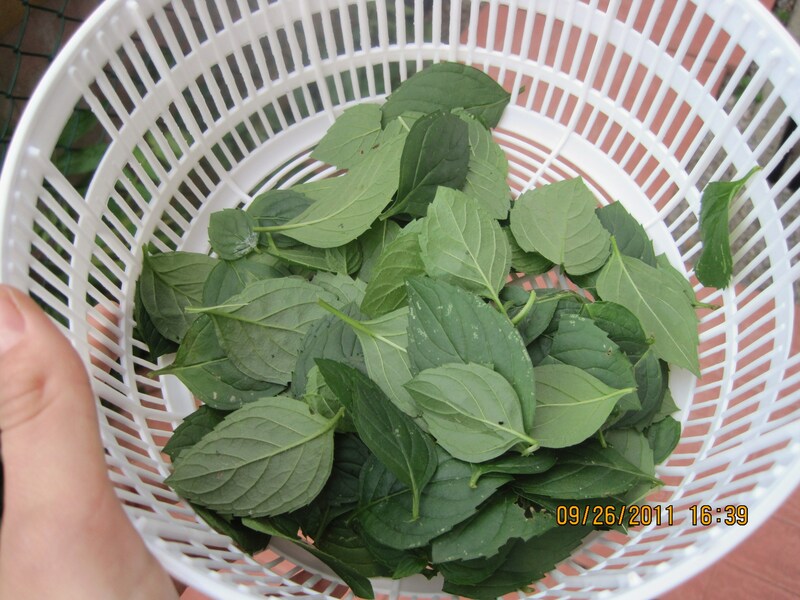 With little to no basil left on its stems, I was forced to turn to the influx of mint in preparation for dinner last night. After not a lot of pasta cooking during the summer, I decided that the end of September called for a hearty pasta dish. Mint and pasta, you say? 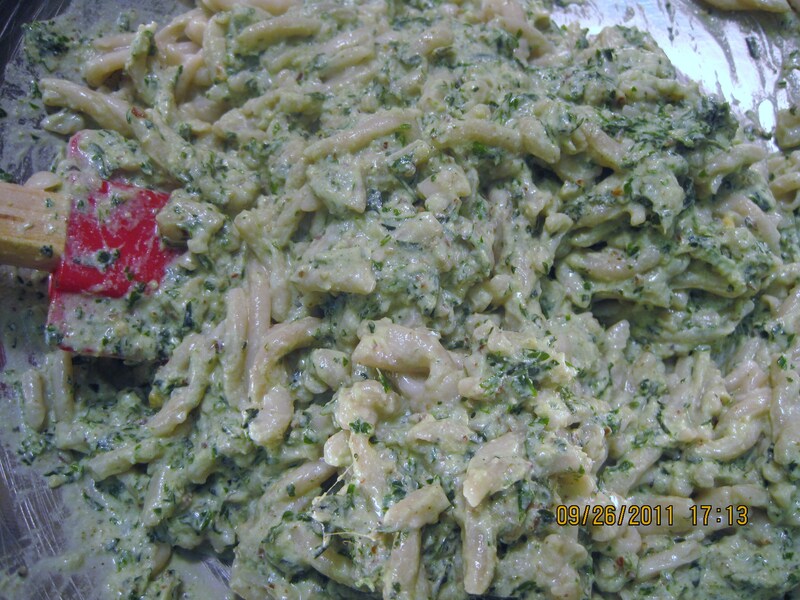 How about mint pesto pasta? 1. 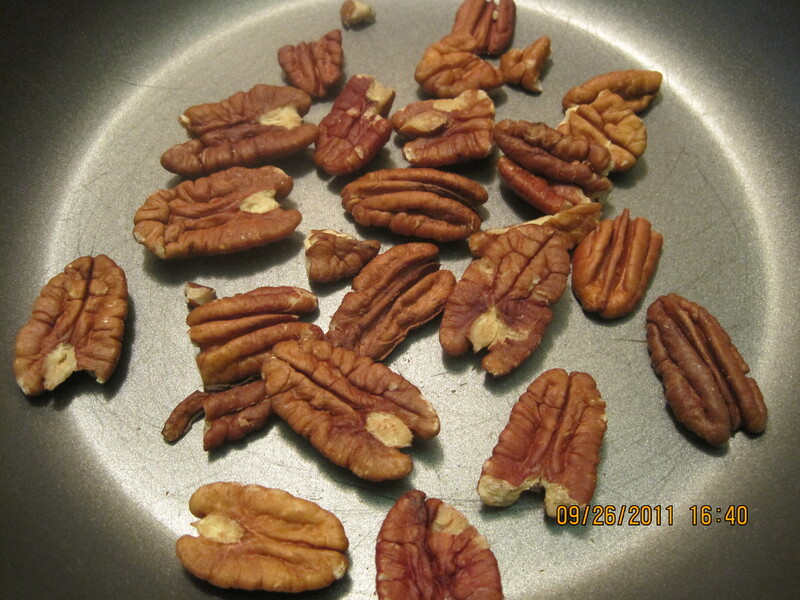 In a small frying pan, toast pecans on medium heat until lightly browned and aromatic. 2. 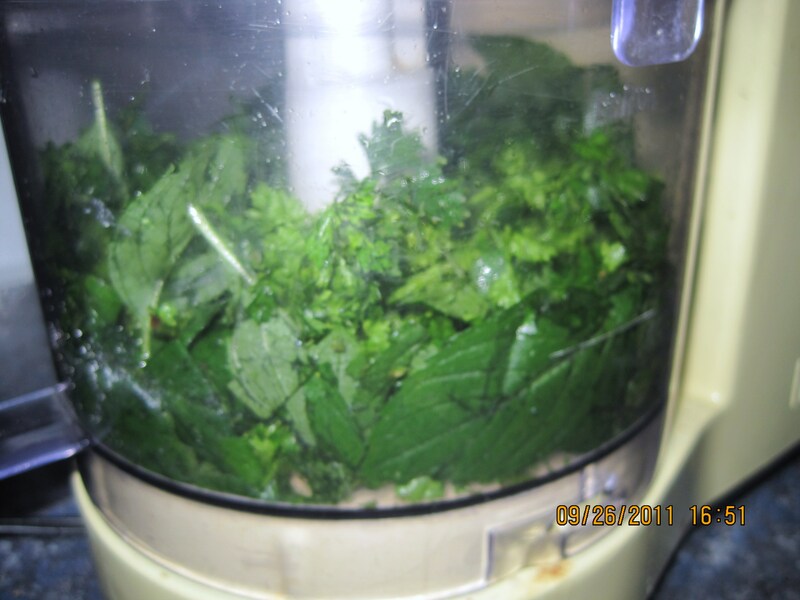 Thoroughly wash mint and parsley, and add to food processor. Puree until roughly chopped. 4. Transfer to another bowl. 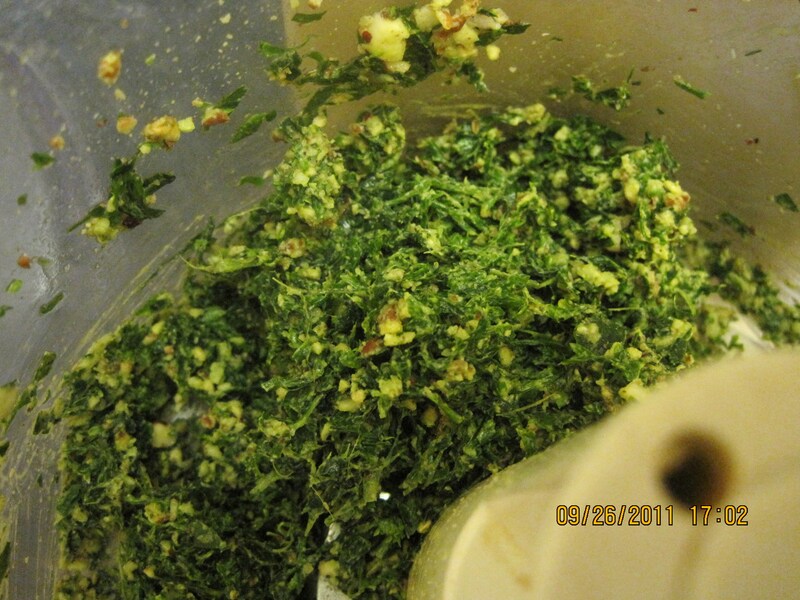 Add the ricotta cheese and mix thoroughly. Add salt and pepper, and chilis. Slowly add water until the sauce reaches the consistancy you desire. Taste. Mmm. 5. 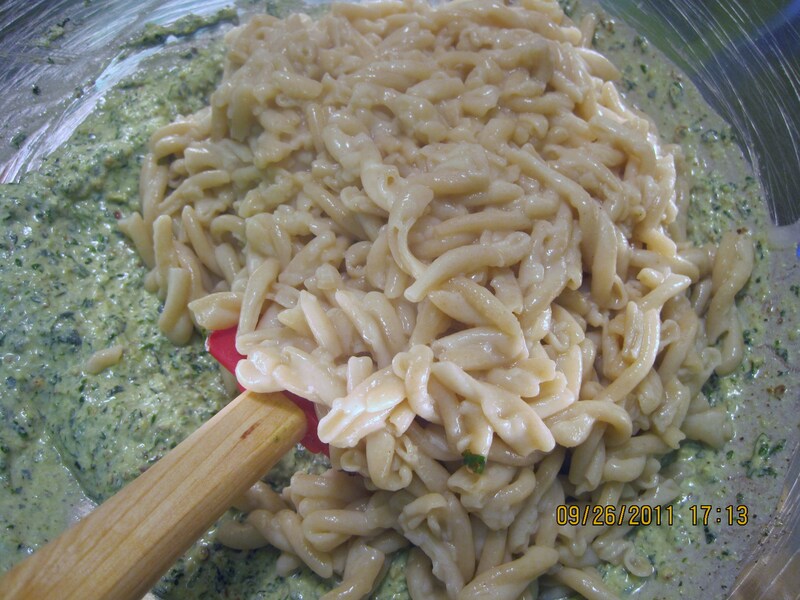 Add cooked pasta (I used brown rice fusilli pasta,) and stir until every noodle is coated. Enjoy! I decided to add chopped cherry tomatoes at the last minute for some colour. I served this alongside a simple salad. It was so creamy and fresh tasting thanks to the mint. I will definately make this again soon with a few changes in hopes to produce a vegan version. What is a priority for you when it comes to house-hunting?